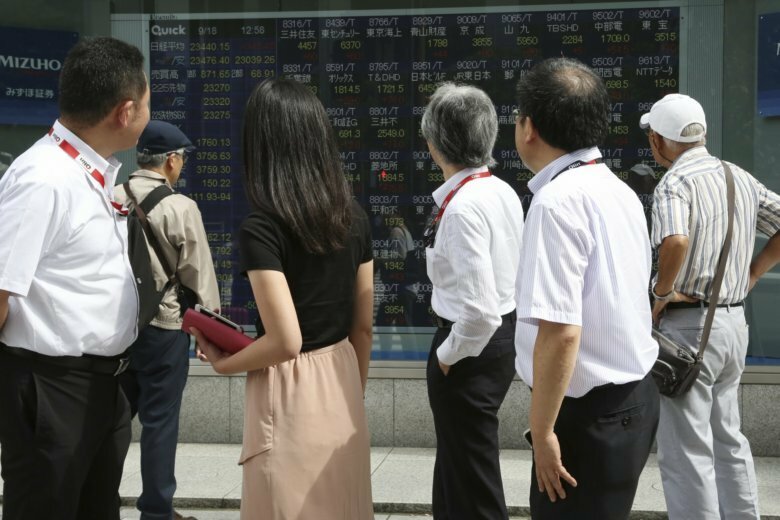 LONDON (AP) — Global stock markets, particularly those in Asia, shrugged off the widely anticipated announcement of further U.S. tariffs on Chinese goods. KEEPING SCORE: Following big gains in Asia, such as a 1.4 percent increase in Japan’s Nikkei 225 stock average, the rebound stalled in Europe. France’s CAC 40 added 0.2 percent to 5,361, while the DAX in Germany rose 0.2 percent to 12,119. Britain’s FTSE 100 was steady at 7,303. Wall Street was set for modest gains at the open too, with Dow futures and the S&P 500 up 0.2 percent. MORE CHINESE TARIFFS: On Monday, Trump announced tariffs on an additional $200 billion of Chinese goods starting next week, potentially raising prices on goods ranging from handbags to bicycle tires. The tariffs will start at 10 percent, beginning Monday of next week, and then rise to 25 percent on Jan. 1. China’s Commerce Ministry vowed to take “counter-measures” on Tuesday but gave no further details. Beijing has warned that it would hit an additional $60 billion in American goods if Trump ordered more tariffs. If China does retaliate, Trump has threatened to add another $267 billion in Chinese imports to the target list. That would raise the total to $517 billion — covering nearly everything China sells in the United States. ASIA’S DAY: Japan’s Nikkei 225, reopening after a national holiday, jumped 1.4 percent to 23,420.54. The Kospi in South Korea added 0.3 percent to 2,308.98. Hong Kong’s Hang Seng index rose 0.6 percent to 27,084.66. The Shanghai Composite index rebounded 1.8 percent to 2,699.95. But Australia’s S&P/ASX 200 shed 0.4 percent to 6,161.50. ENERGY: Benchmark U.S. crude rose 84 cents to $69.75 a barrel on Tuesday while Brent crude, used to price international oils, advanced 92 cents to $79 a barrel. CURRENCIES: The euro was up 0.2 percent at $1.1706 while the dollar rose 0.2 percent to 112.10 yen.